As Gokulashtami is nearing, I wanted to share an easy sweet made with flattened rice/beaten rice (known as aval in Tamil). The method is similar to rava kesari but is made with poha/aval. It is easy to make and tastes delicious. Usually we make thattai, seedai and murukku for Krishna Jayanthi, but if you do not find time but still want to do something for Krishma Jayanthi, you can make this poha kesari or even vella aval. Today we will learn how to make aval kesari following this easy recipe with step wise pictures. Heat a tsp of ghee and fry cashew nuts until golden brown. Remove it and keep it aside. In the same pan, fry the poha/aval on medium heat, stirring continuously, until it changes color slightly. Once it cools, grind it coarsely in a mixie or blender. Boil a cup of water in a pan. When water starts boiling, reduce the heat to low and add the coarsely ground poha slowly with one hand and keep stirring with your other hand. Add a drop of orange color or a pinch of kesari powder. Mix well and cook stirring on medium heat. When it thickens slightly, add sugar and a tbsp of ghee. Cook stirring for a few more minutes and add another tbsp of ghee. Keep cooking on medium heat until it leaves the sides of the pan. Add the rest of the ghee, cardamom powder and cashew nuts. Mix well and remove from heat. Enjoy making this quick and easy poha kesari for Krishna Jayanthi. do i need to soak poha ? Thick poha is better but if you cannot get, you can use any poha. Hi pudhu, Only white aval should be used or can use red aval too? You can use red aval also and follow the same method. Avoid the color. 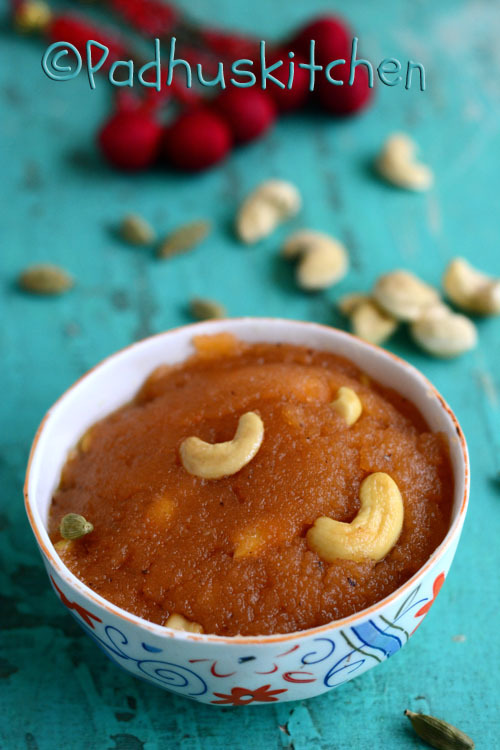 Looks so delicious, nice twist on the usual rava kesari. Thick or thin poha to be used? You can use any poha.